Occasionally something comes up that you had never dreamed of . . . I have posted about Ceres many times. Built in 1811, she belonged to my great great grandfather, then my great grandfather and finally my grandfather before she went down off Baggy Point in North Devon in 1936. When she sank she was 125 years old, nominally the oldest boat on Lloyds’ Register. I say ‘nominally’ because such was the wear and tear on these ships that it is probable that every plank, every fastening had been replaced at some stage during those years. Built initially for the Azores fruit trade as a single-masted smack, Ceres was extended and converted into a ketch, ploughing the important coastal routes particularly in the Westcountry. She lived through the demise of the wooden sailing ship which began around 1870 with the new technologies of steam and metal. For centuries, maritime economies had been built around wood and sail – seaborne trade, the design of ports and the ancillary industries that developed around them had all been dependent on these slowly evolving – (by modern standards), vessels that were governed by the weather. 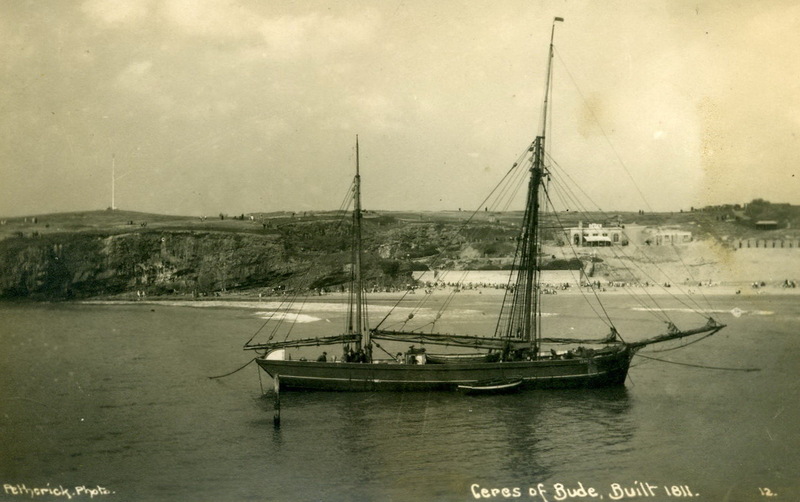 In her book ‘Jane Slade of Polruan’, Helen Doe states that success for the investors in these ships was “dependent on good weather, a capable master and crew, a well-built ship, a regular supply of cargoes and good fortune”. In a few more decades, all this would change and the skills and much of the knowledge and attitudes that went with them would no longer be required. I have many photographs of her but never dreamed that a film existed of her locking-in to Bude canal. Well, one does – a grainy, family film made around 1930. Here is the link. The relevant section of the film is about 1/5 from the beginning. My thanks to my sister, Anne, for pointing it out. Doe, H. “Jane Slade of Polruan”, Truran. Duffy et al, “The New Maritime History of Devon”, Conway Maritime Press.